Nigerian entertainer and songwriter, Nicky WD is out with a new single called “Believe”. 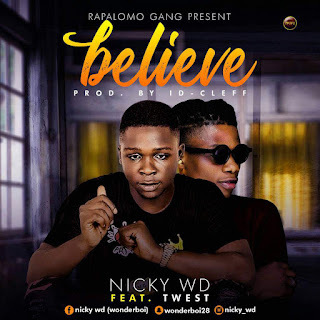 Fresh out of the stables of his label – RAPALOMO GANG, Nicky WD jumps on an upbeat tune created by ID Cleff to deliver a Motivating rap vibe with T-West. When Hustle was being recorded, little did Nicky WD know that it would have such a warm reception, it was just fine blend of raw talent and sheer passion. “Everyday Me I they Grind , I get this money for my mind , See Double Your hustle cause I don't get your time..." Which means, Hard Work pays and Never Stop Believing. Vibe to the jam below, share your thoughts and share with friends.